Menavlatoi are the evolution of Peltastai. Better equipped, motivated and trained, they pack quite a punch. They use a heavy javelin called “Menavlion” (from which they derive their name) against enemy cavalry. Those “Menavlia” javelins are the worse threat to heavy cav there is, especially when thrown by properly trained troops like Menavlatoi are. “Menavlion” is a thick headed javelin with a long 50cm iron spearhead. Their defensive equipment and weapons are similar to the Skoutatoi but with a predominance of leather and padded coats over iron. Military manuals of the time suggest that the first line defends with long “akontion” spear and shield, while all other lines throw their “menavlia” heavy javelins. The effects of massed “menavlia” heavy javelins on the enemy cavalry must have been devastating, be it light or heavy. Menavlatoi must have been the ultimate close contact javelin troops of their time. 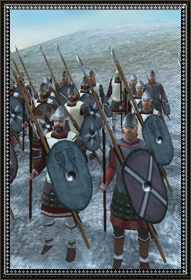 Historically, Menavlatoi are a unique Roman unit, combining the battleline tactics of two units which were formed in the Roman Empire. According to the 11th century Parisinus graecus, it places the peltastai right behind the the front ranking hoplitai. Menavlatoi combine both troops as both a pike infantry to withstand a full enemy cataphract assault, but also “menavlion” heavy javelin throwing infantry to break the first lines of assaulting cavalry. Menavlion was a shorter, thicker, heavier javelin, with possibly the longest winged spearhead (about 50 cm). "Menavlos" "μέναυλος" was a type of lilly flower, as described in a 4th cent greek dictionary. "Menavlia" also are mentioned as spears/heavy javelins special for boar hunting. Menavlatoi are one of many units that have their names changed over the course of history but not necessarily their tactical role and functions. Much controversy on the subject of names and the functions they performed remains, however. Nor were they simply a missile unit. If anything the closest unit that can compare to them would be the Hellenistic era “Hypaspistai” in their “Pheraspidai” / ”Euzonoi” role, aka heavy peltasts who can also fight.